Courses Eligible for Education Loan? Almost all private & public sector banks offer educational loans in India. Although the intention is to provide educational loans at easy term & affordable interest rates to facilitate the deserving students to pursue their dream of a higher education, these loans are obtainable for definite courses offered by certain specific institutes. Just like all other loans, education loans are also given if the applicant meets the eligibility criterion laid down by the lender. Since these loans are given for pursuing higher education, the course & institute are of paramount importance. In this blog, we will discuss the institutes & courses for which education loans are available. As already said, these loans are available on easy terms & conditions, education loan interest rates fixed by most of the lenders are generally not too high. Still, there are certain eligibility criteria that must be fulfilled by the loan applicant for availing educational loans. We will further discuss the acceptable courses & institutes in the next paragraph. Educational loans are available for citizens of India; they must have the necessary documents that prove admission to the said course & institute, expenditure details, identity or address proof, income proof of the guardian/parent/co-borrower, their IT returns and so on which are needed when applying for an education loan. Parents or guardians are required to be co-applicant for all education loans, however for loans more than Rs. 7.5 lakhs tangible assets may be required as security or collateral & for loans between Rs. 4 lakhs and 7.5 lakhs, a third party guarantee may be needed. Lenders may ask for the credit report of the co-applicant in order to assess his credit worthiness & judge if he can be relied upon to repay the loan in case the loan applicant (their child/ward) fails to do so after course completion. Diploma/Degree courses in areas of aeronautics, shipping, pilot training that are offered by recognized bodies in the respective filed. Vocational courses that are offered by a Government organization or department, State Skill Missions, State Skill Corporations etc. For students looking at seeking education abroad can seek a loan for courses offered by well-known Universities and also for CPA in US, CIMA in London and so on. Despite the fact that the course that is to be pursued is important, the institute to which admission is sought is also considered while sanctioning the education loan. Banks & NBFCs offer loans for courses that are accessible at recognized institutes & universities both in India and overseas. A good course & a renowned institute make certain that the student will find appropriate employment after course completion and will be able to repay the loan. Loans are available for a courses offered at UGC, AICTE, AIBMS, IMCR and Government recognized universities and colleges; Polytechnic Colleges and recognized branches of foreign schools in India. 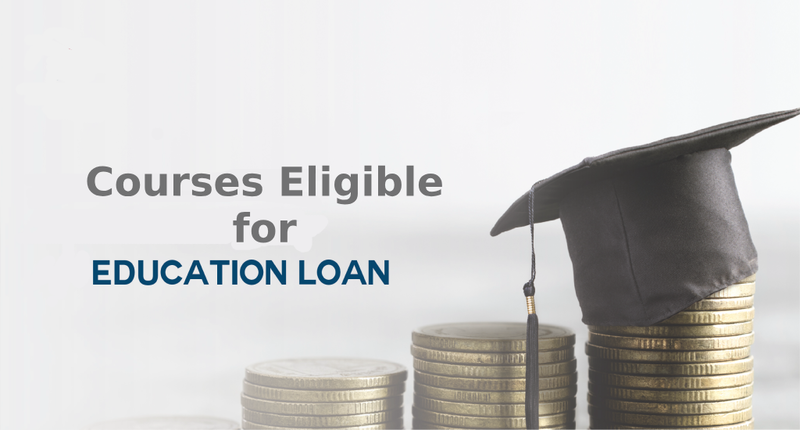 You should do thorough research about the educational loans offered by each lender & also their eligibility criteria so that you can access the funds in time to secure your admission to the course. For any query or getting education loans without hassles, you can log on to www.afinoz.com, or email us at info@afinoz.com.